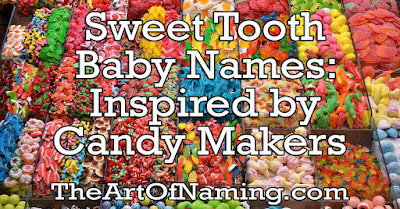 While there are quite possibly hundreds of other companies around the world that produce candy, these are some of the ones whose names could work on a human as well. 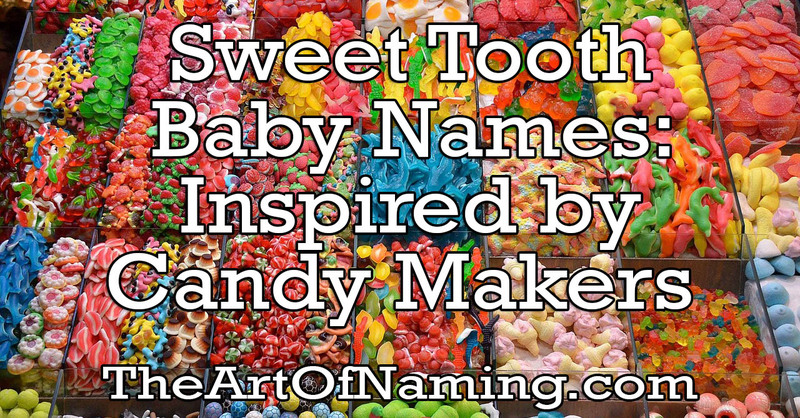 If you're looking for a sweet name for your little one, perhaps you'd draw inspiration from one of these brands. The following list is comprised of companies that manufacture candy and chocolate. Adams & Brooks - Adam is a classic, but Brooks is an up-and-coming surname name that ends with the trendy letter "-s" and ranks up at #232 in 2015. Either name would be a non-obvious nod to the makers of the "whirly pop". Albert's Candy - If you're a fan of fruit chews and splash pops, you may like this name. The company was started by Robert Lawrence Albert in 1916, which checks out since the name Albert ranked the best back around 1920. There are still plenty of little Alberts being born today. Nearly 700 in 2015, to be exact. Allan Candy - Well known across Canada for their gummy candy, this company is now a part of Hershey. As a name, this spelling of Allan is less common than Alan and Allen, but it still ranks within the Top 1000 in the US. Annabelle's Candy - Sweet Annabelle is a great name for a girl who loves her taffy and s'mores. As a name, Annabelle really ranked well in 2014, hitting a high of #57. It's back down to #92 now but still an excellent choice if you want a more popular name. Asher's Candy - This is the company responsible for Jelly Belly jelly beans, as well as an assortment of fancy boxed chocolate. That right there is enough of a reason to opt for the name Asher! Most parents probably chose it for other reasons though, since it is at a high of #83 in 2015. Brach's Candy - There's Brock and Barack, why not Brach? As a name, Brach appeared on record a handful of times between 1976 and 2003. This company makes a big assortment of hard candies, gummies, mints, jelly beans, candy corn and chews. Brown & Haley - Brown might not be used as a name, but there's Bruno, or perhaps Hazel which would go nicely with Haley as matchy twin names. Haley was most popular in the late 1990s and early 2000s. Bruno had two popularity peaks, 1916 and 2014, a great example of the 100-year rule on the boy side. Hazel is on that same track, ranking best in 1918 and currently climbing the charts. Dante Confections - This company makes chocolate confections and truffles in fancy boxes using stevia and dark chocolate. The name Dante means "enduring" and has been used in the US since 1908. It was most popular in 1998 but still ranks at #322 in 2015. Dorval Candy - This name is not in use in the US, but doesn't it sound like it should be? It has that stylish V in the middle to go along with other names like Evan or Donovan. And it is even better if you like sour candy straws and sour popping candy! Dryden & Palmer Candy - While Dryden has only been around since 1992 and has never been close to the Top 1000, Palmer is on record way back in 1880. What do you think of this duo? Farley's & Sathers - Farley has been used as a name from 1913-1991 in the US. It has a cool sound, and if you enjoy "now & laters" and "super bubble", you may feel compelled to go for it. However, Sathers probably wouldn't sound that great on a baby. Gilliam Candy - This company is known for their variety of striped stick candy. Gilliam is related to the name William by way of the French Guillaume. The name hasn't been used since the 1950s in the US, though. Hershey's - If you love the various candy and chocolate made by this famous company, the name Hershey is nice and uncommon. It hasn't really been used since the 1940s. If you'd like a similar sound, the name Hershel is a cool alternative. Judson-Atkinson Candy - They produce a variety of fruity and nutty candy. The name Judson has been in use since 1880 in the US, and ranked until 1986. It dropped out for a bit and then returned in 2014. Could it be the new Hudson? Atkinson has never been used as a given name in the US, but no doubt it is a common last name. Kenny's Super Twists - As the name implies, the company focuses on licorice and rope candy. The name Kenny has been used since 1908 and peaked in 1960 as a stand alone name, but it can also be short for Kenneth or Kendrick. Would you use Kenny by itself? Kimmie Candy - This company has a variety of candies from "chocorocks" to "sunbursts". The name Kimmie is usually short for Kimberly but can be used alone. This spelling has been used in the US since 1952, but only a small handful of babies per year receive the name. Kit's Taffy - Kit's taffy comes in a handful of classic flavors. As a name, Kit is a diminutive of both Christopher and Katherine. It has been used for both genders since the early 1900s as a stand alone name. Koppers Candy - This company specializes in chocolate covered candy, fruit, nuts, and coffee beans. The spelling of Kopper hasn't been used on record in the US, but Copper has been used since 2001. And there's also the similar Cooper or Kooper if you'd prefer. Liberty Orchards - They are best known for their "Aplets & Cotlets" confection made of apples and apricots. The name Liberty comes from a Latin word meaning "free" and it has had three popularity peaks in 1918, 1976 and 2004. The nickname Libby makes it feel wearable today! Lowney's Chocolates - This company lasted from the early 1880s until its factory closed in 2010. In honor of this maker of chocolate bonbons, the name Lowney could make for an interesting middle name. However, it has never been used as a first name on record in the US. Madelaine Chocolate - Established in 1949, this chocolate company focuses on holiday and themed chocolates as well as treats for everyday. The name Madelaine has been in use since the early 1900s. 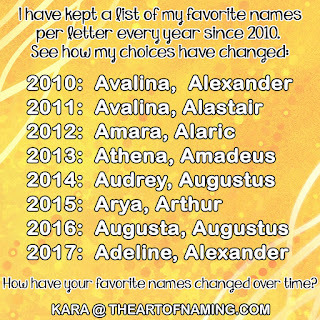 It isn't as popular as sister names Madeline or Madeleine and has never ranked in the Top 1000. Which do you like best? Marich Candy - This company was opened in 1983 by the creator of the Jelly Belly who had worked for other companies until then. They produce a wide range of chocolate covered fruit and nuts in California. Marich has a cool surname vibe but if you aren't keen on the spelling, try the similar Marek or Merrick instead. Marich has never been on record in the US. Pearson's Candy - Pearson's Candy has made quality confections since 1909, including "bit-o-honey", mint patties and nut goodies. If you're a fan, the name Pearson has been around since 1898 but has never been popular enough to hit the Top 1000. You could help change that. Peter Paul Candy Manufacturing Company - As a company, much of their product line has been purchased by Hershey, including their Almond Joy. Both Peter and Paul are classic biblical names that work well together and separately. Which do you like more? Primrose Candy Company - This is one of the lesser known rose names that reappeared on record in 2012, presumably because of the character in The Hunger Games. The company has been around since 1928 and makes hard candy, chewy candy, caramel, taffy and popcorn confections. Thompson Chocolate - Since 1879, this company has been making chocolate decorated as gold coins and silver stars. The name Thompson is usually thought of as a surname but it has also been a given name since 1882 in the US. It has never been popular, though, receiving a high of 56 births in a year in 2015. Toms International - If Thompson is too long, maybe you'd prefer just Tom. On its own, the name Tom has actually ranked within the Top 1000 from 1880-1995. It has fallen below the chart now, but still had 67 births for 2015. This European company makes chocolate, liquorice and sugar confectionery. Tootsie Candy - Believe it or not, Tootsie has been given to 58 girls on record between 1920-1959. This isn't necessarily recommended as a full given name, but Tootsie could be a cute pet name or nickname. And who doesn't love a good Tootsie Roll or Blow Pop, now and then? Whittaker's Chocolate - Since 1896, Whittaker's Chocolate has been a favorite in New Zealand. They make a variety of delicious things, from creamy milk chocolate bars to those with peanuts or cranberries. As a given name in the US, Whittaker first appeared in 2002. While it remains obscure with only 13 births in 2015, it would be an interesting choice! Wrigley Candy - Wrigley doesn't just make gum, they are also responsible for Life Savers, Altoids, Skittles and Starburst. However, those who receive the name Wrigley are more likely to be born to Chicago Cubs fans. Interestingly, the name has only been on record in the US since 2003 and is given nearly equally to both genders.